The new EC tyre labelling requirements come into effect in November, compelling everyone involved in the manufacture distribution and fitting of vehicle tyres to label new tyres for ‘fuel efficiency’, wet grip and drive-by noise. Explained here. A start has to be made somewhere, of course, but these factors alone do not provide sufficient information for buyers to decide which tyres to fit. So, partly to introduce the new legislation to retailers, and also to launch its new Energy Saver + and Agilis + tyres in the UK, Michelin laid on a ‘Balance of Performance’ roadshow at the Motor Industry Research Association facility near Nuneaton. By ‘Balance of Performance’ Michelin means the other factors that need to be considered when buying tyres. Safety is not merely about wet braking. It also has to cover dry braking where 70% of all crashes occur. Urban conditions where 60% of all crashes occur. Straight roads where 75% of all crashes occur. Cornering where 25% of all crashes occur and where crashes tend to have the most severe consequences. Crashes in only very slightly damp conditions. In fact 99% of crashes in wet conditions occur when the roads are only very slightly damp. These figures were provided by VUFO of Dresden, the principal crash analysis centre in Europe. First, a series of dry weather tests and demonstrations. 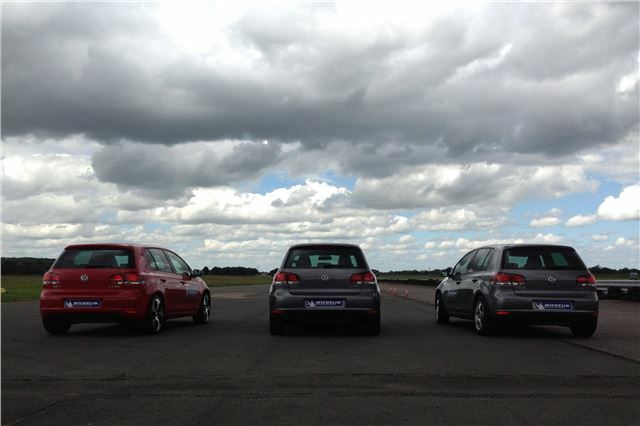 This was a slalom test through cones at 25-30mph in VW Golf 2.0TDI DSGs fitted with 205/55 R16 Michelin Energy Saver + tyres, 225/45 R17 Michelin Primacy 3 tyres and 225/40 R18 Michelin Pilot Sport 3 tyres. Obviously the ride quality got progressively worse, but grip through the cones allowed progressively higher speeds the lower the profile of the tyres. The Pilot Sport 3s would have been about 5mph quicker had it not rained just before my run on them. Next up, a passenger ride in a Ginetta G60 on Michelin Pilot Supersports, basically to demonstrate the high level not just of grip but of feel and progression at the limits of adhesion. Another passenger ride, this time in an ageing Jaguar X350 XJR, to demonstrate grip of Michelin Pilot Supersports at up to 120mph on banked curves. Then, the most impressive part of the dry demonstration, a Mercedes Sprinter van fitted with the new Agilis + tyres. This braked and steered almost unbelievably well, despite reduced rolling resistance compared to its predecessor that offers fuel savings of up to 150 litres over 43,000 miles. This has been achieved by replacing Carbon Black in the tyres with Silica. The new Agilis+ tyres also offer improved kerbing protection in the sidewalls. A pair of MINI Cooper S models were fitted with Michelin Energy Saver + and competitor tyres and the idea was to find the point of break away on a wet steering pad. The competitor tyres were more fun because breakaway happened about 5mph earlier, but having fun was not the object of the exercise. The Michelins hung on much longer and were obviously safer in wet conditions. There were demo runs in VW Passat CCs on Primacy 3s v/s a competitor tyre and a BMW M3 on Pilot Supersports driven on a wet track outstandlingly smoothly yet at serious speeds by MIRA Driver Trainer, Nigel Smith. I’ve never been less frightened in my life. After that, wet braking tests in Peugeot 208s fitted with Energy Saver + against a competitive tyre and Mercedes Sprinters fitted with Agilis + against a competitor. In both cases, braking from 90kmh in the 208s and from 70kmh in the Sprinters, the Michelins stopped the vehicles on average two metres shorter. Explanation of new tyre labelling regulations here. Vis-a-vis the proposed 40 m.p.h. rural roads speed limit, most fatalities occur on rural roads with a 60 limit.